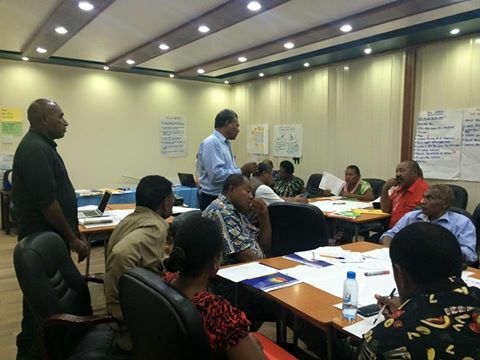 Around 30 people known as duty bearers from three districts in the Central Province including Rigo; Kairuku Hiri and Abau attended the three day workshop on Family and Sexual Violence facilitated by Child fund PNG which ended yesterday. The workshop was aimed at building the capacity of duty bearers who are government officers representing all sectors of development in the Central Province to come up with a range of support services for survivors of family and sexual violence; map local referral pathways and look at how more services can be established at the local level. Sally Beadle, the Gender Advisor for Childfund said ChildFund is working on a project funded by the EU and part of the project involves working with human rights defenders in the Central Province to build their capacity or their understanding on the issue of family and sexual violence and to assist the survivors to access services they need. Another duty bearer, Leoni Vele who is a trainer for Education for elementary teachers from the Abau District said one of the key factors of victims coming out confidently to report cases of sexual violence is due to awareness carried out by human rights defenders and the access of mobile phones and radio. Susan Setae, a Counselling Officer at the Family and Sexual Violence Secretariat present for the workshop commended Childfund for their efforts in addressing this pressing issue and said it has always been the NGOs role to fill in the gaps. She however, acknowledged that the government is now taking the lead in addressing this issue as evident through the recently endorsed GBV strategy and other related policies.